Genealogies are a prevalent feature of the cultures of the ancient Mediterranean and the Arabian Peninsula. They provide continuity and permanence by relating individuals and groups as well as man and the gods. Social realities were constructed along vertical genealogical lines by connecting to the past, thus emphasizing order, permanence and stability. Gaps and discontinuities were harmonized, and perpetuation and continuation guaranteed, thereby legitimizing religious, political and ethnic claims and prerogatives. Genealogies share this function with the origin myths and migration narratives of real or fictional individuals, tribes or ethnic groups. The entanglement of genealogies and myths of wandering has long required a consideration from an interdisciplinary perspective. 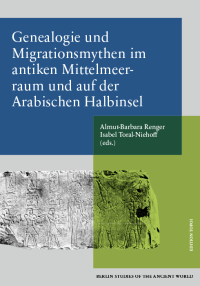 This volume aims to meet this desideratum, with articles based on case studies in the fields of religious studies and theology, biblical and classical archaeology, ancient history, Greek and Latin philology, Egyptology and Arabic studies.